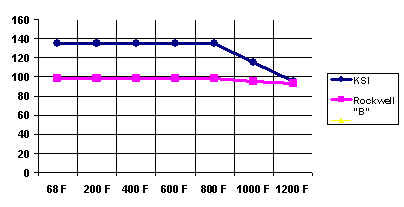 Upper Line: Demonstrates that ULTIMATE TENSILE STRENGTH will remain constant to around 650 Degrees Fahrenheit, with only a slight drop from 650 to 800 degrees F. Over 900 Degrees F the tensile drops more dramatically, stabilizing again at 1,200 degrees F.
Lower Line: demonstrates that HARDNESS remains constant to 500 degrees F. Test results show that prolonged temperatures of 900 - 1,000 degrees F will lower the hardness to roughly 20 Rockwell "C". Upper Line: Demonstrates that ULTIMATE TENSILE STRENGTH will remain constant to around 850 degrees Fahrenheit with only a slight drop from 950 to 1000. Over 1000 Degrees F the tensile drops more dramatically. Lower Line: Demonstrates that HARDNESS fluctuates in a range above 92 Rockwell "B" up to 700 degrees Fahrenheit. Test results show that prolonged temperatures of 900 - 1,000 degrees F will lower the hardness to 90 Rockwell "B" or a few points below. Information supplied by Performance Alloys and Services, Inc. is based on independent as well as in-house testing of samples of production material. Changes to properties of heat treated alloys are a result of temperature exposures that are beyond the final aging or drawing temperature of the alloy.